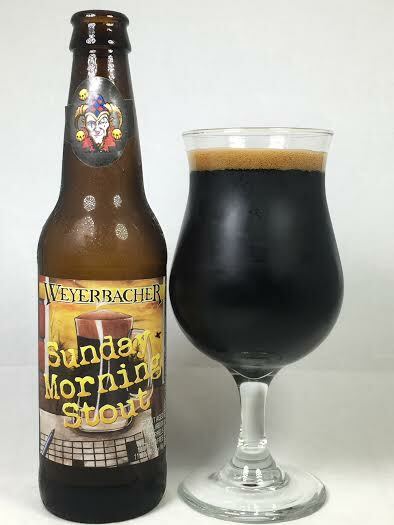 I think like most people, I had never heard of Sunday Morning Stout until this year. I'm not sure if this was the first year it was bottled and distributed to all of Weyerbacher's markets, but I do believe it was a draft-only release in previous years. It's an Imperial Stout aged in bourbon barrels with coffee. Pours jet black with less than a finger of a dark brown head. I can barely see some ruby red on the edge when held up to the light, but this is just dark as night. The aroma blasts you with massive amounts of coffee - rich roasted coffee and big vanilla. After that is sweet bourbon, dark chocolate, milk chocolate, and oak. It smells more like a coffee stout with bourbon rather then a bourbon barrel-aged stout with coffee. Mouthfeel is silky and creamy like a rich espresso. This is great due to its mouth-coating tendency and also that it leaves flavors sticking to your tongue and roof of your mouth without being cloying. Maybe a little residual bitterness from the coffee in the aftertaste that leaves me smacking my lips, but it's easy to live with. At over 11.00% I do feel a warming sensation in my throat that is persistent with each sip, but no alcohol presence whatsoever. It's understandable with such a big beer, so just be prepared to sip this one for a while. Sunday Morning Stout has the makings of a "breakfast beer" with a big coffee base and a supporting cast chocolate and vanilla. Throwing it into a barrel has yielded a complex stout with enough flavors to keep anyone guessing. Some flavors dominate more than others and this has a few bitter components that can be overpowering at times. In the end, this is an incredibly complex, barrel-aged beer that checks off all the criteria for a great stout.